Some time ago, someone told me about the displays used in the higher-end Nokia dumbphones and lower-end smartphones, like the 6210, E66, E75, N78 and N82. These displays are small 2.4 inch TFTs with a nice QVGA resolution of 320x240 pixels. What I didn't know was the wey these TFTs were controlled: I always thought they needed a GPU in the phone itself to display anything. They don't: these LCDs all have a chip and graphical display memory on board. It's enough to tell them what to display only once, instead of having to stream every pixel to it 50 times a second. What's more: the economics of scale make these LCDs obtainable for something like ten Euros, a feasible amount of money to pay for something to experiment with. I immediately got three of them and while they were shipping I scoured the Internet for any and all information on the subject. I found out a few forums where research had been done on the subject. 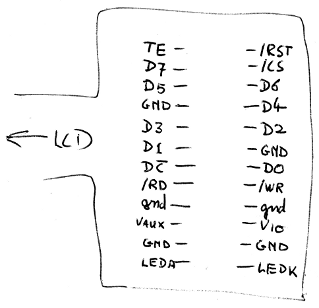 It seems the interface to the LCDs is somewhat standardized: there are LCDs with different controller chips on the market, but they all have the same pinout and basic control method. The pinout itself is documented somewhat on various pages on the Internet, but not 100% correctly: the pinout I found working is here. Because the command set is somewhat standardized, you can grab a datasheet for any of the display controllers used: I got my info from this one. So, now what to do with my newly-found-to-be-controllable 76800 pixels? Well, I really like the game Minecraft, and I really liked it when Thinkgeek put up a page selling a real-life Minecraft Nether portal. Unfortunately, they did so on April the first and the device turned out to be a joke. With a nice TFT and a bit of wood and electronic handywork, nothing would stop me from making my very own version, though.